There are literally hundreds of scan apps for smartphones in the Apple Store and the Google Play Store (for free and for purchase). We have found only one that exports a properly formatted .CSV file. If you locate one, please let us know so we can update this list. Go to BerryWing.com on your smartphone, download and install the appropriate app on your smartphone. There is a wide range of scan guns, differing mostly in the number of features it has and, of course, dollars. Checking in registrants only requires one of these simpler models. Here is a link to a few thousand scan guns. Most of these scan guns plug into your laptop's USB port. Some will connect with blue-tooth protocol. 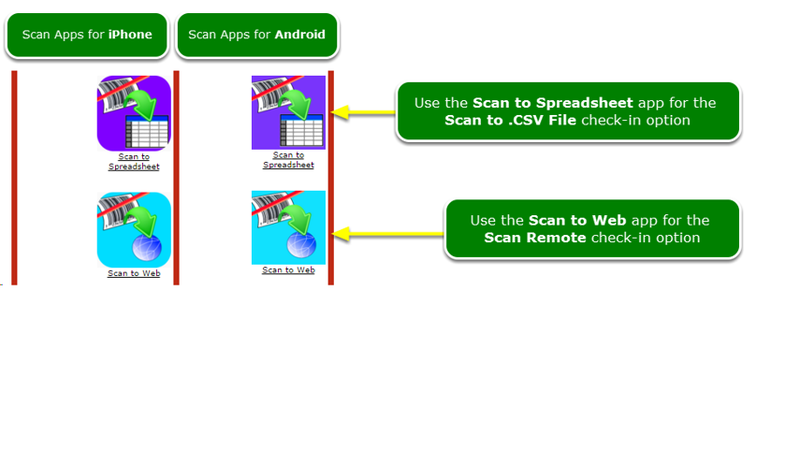 When a scan is initiated, the scan gun sends the number printed under the barcode to a "listener" on the laptop or tablet, which then marks that person "Attended" and refreshes, waiting on the next scan. Internet access is assumed. A few scan guns will also save a .CSV file to the gun's SD card or memory, which can be imported into rsvpBOOK to mark registrants attended. Use this type of scan gun if your venue does not have internet access. This is a chapter of articles describing how to use Kiosk Mode for checking in attendees as they arrive for your event.